* Beshem hashem. Literally: “In the name of the Name”. Rabbinic literature traditionally substitutes with the term “the Name” the unspeakable Godname, the tetragrammaton (YHWH – Jahveh). Illustrious young man, a great hope of his great father, / and the greatest hope of us and of our miserable fatherland, / What should I tell you? which advice should I give you now when you set out? / What should my ardent bosom wish for you? / Remember why you set off from your fatherland: / and COME HOME. This is my supreme advice. / And my supreme wish is that may the BLESSING OF GOD lead you to everywhere / and finally bring back to us. I have improvised it in Nagyszeben of Transylvania, in the same month of July 5, in the 1711th year of the birth of Christ. Sámuel Kaposi Juhász (Sámuel Kapusi) was born in 1660 in Rimaszombat (Rimavská Sobota), a son of the minister János Kaposi Juhász. After his studies he became the rector of the local school, but in the same year he set out abroad. In 1683 and in 1686 he was immatriculated to the university of Utrecht, while on March 9, 1684 to that of Leiden. During his Utrecht study years he was a corrector, together with János Csécsi, Sen. of the Hungarian Protestant Bible published in Amsterdam by the printer Miklós Misztótfalusi Kis, and he also supported Misztótfalusi in later years. He also visited other universities, both in Germany and England. In Leiden He was granted the degree of ThD sine disputatione. In 1688 he came home, and in 1689 he went to teach in Gyulafehérvár (Alba Iulia), to where the Reformed College of Sárospatak was fled to safeguard. He taught philosophy as well as Latin, Greek, English and Oriental languages. He achieved much for the spiritual and material development of the college. He was respected also by the representatives of other confessions. He was said to remember texts once read, what is more even the exact page numbers, even after many years. He died on July 23, 1713 in Gyulafehérvár; he was said to have been poisoned. He wrote several laudatory poems to his friends and fellow students, for example to some works of Ferenc Pápai Páriz, Sen. (1696, 1708), or a five-languages one – in Hungarian, Latin, Greek, Hebrew and Syriac – to Miklós Apáti (1686-88). Amongst his manuscripts we find a Commentary to the Catechism of Heidelberg, an Introductio theologico-historica and a number of other works. Amongst the printed ones are: Dissertatio de desertione spirituali. Utrecht, 1683. – Memoriale hebraicum, exhibens lexici Hebraici compendium metricum … Kolozsvár, 1698 (the first Hebrew print in Hungary); 2nd edition: Utrecht, 1738. – Breviarium biblicum, sive quatuor priora capita Geneseos Hebraice edita. Kolozsvár, 1699. – Gamelion melographicum … Kolozsvár, 1702. 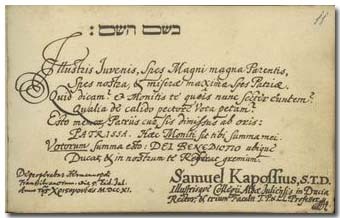 The young Ferenc Pápai Páriz gave his Album in the summer of 1711, shortly before his leaving the country, to the close friend of his father, Sámuel Kaposi Juhász, Rector of Gyulafehérvár, who at that time was in Nagyszeben. The term “in the same month of July” probably refers to the note of Bishop István Veszprémi, dated on July 1, 1711 (p. 5). The son of the above mentioned János Csécsi also noted in the Album in Halle in 1712 (p. 352. ).